We’d love your help. 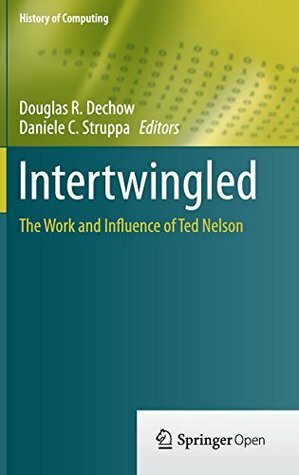 Let us know what’s wrong with this preview of Intertwingled by Douglas R. Dechow. This engaging volume celebrates the life and work of Theodor Holm Ted Nelson, a pioneer and legendary figure from the history of early computing. Presenting contributions from world-renowned computer scientists and figures from the media industry, the book delves into hypertext, the docuverse, Xanadu, and other products of Ted Nelson s unique mind. Topics and features: incl This engaging volume celebrates the life and work of Theodor Holm Ted Nelson, a pioneer and legendary figure from the history of early computing. Presenting contributions from world-renowned computer scientists and figures from the media industry, the book delves into hypertext, the docuverse, Xanadu, and other products of Ted Nelson s unique mind. Topics and features: includes a cartoon and a sequence of poems created in Nelson s honor, reflecting his wide-ranging and interdisciplinary intellect; presents peer histories, providing a sense of the milieu that resulted from Nelson s ideas; contains personal accounts revealing what it is like to collaborate directly with Nelson; describes Nelson s legacy from the perspective of his contemporaries from the computing world and the scholars who continue to examine his work; provides a contribution from Ted Nelson himself. With a broad appeal spanning practitioners in computer science, historians of science and the general reader, this inspiring collection reveals the continuing influence of the original visionary of the World Wide Web. To ask other readers questions about Intertwingled, please sign up. This book is an interesting look into the life and impact of someone who had a great influence on the early days of computing and the internet, in some ways predicting and inspiring the web we have today, even while he is dissatisfied (to put it mildly) with the actuality of the web we have versus the hyperlinked network of content he envisioned so long ago. I have mixed feelings about Ted Nelson and his work, but this book does not present much of a mixed message, being the proceedings of a conference celebrating his work and achievements. The fact that his most concrete achievement, a 2-in-one book called Computer Lib (from one direction) / Dream Machines (flipped and read the other way), was not lost on the attendees. Reading through, nearly every chapter began with how the presenter first found that book and the influence it had on them. So this is, by and large, the testimony of the faithful, believers in the vision. Which is fine, the alternative view was summed up sufficiently by Gary Wolf, in a 1995 article for Wired, "The Curse of Xanadu." Xanadu, in this context, being Dr. Nelson's never-implemented software that he continues to claim is far superior to the web or any software that actually exists. Given that he has been pushing this idea in one form or another since 1965, he gets a good claim on world's longest running vapourware. Of course, if people are unconvinced by your ideas after 50 years, and numerous attempts to actually build those ideas have failed, there is always the chance that the ideas aren't really the answer you think they are. For Nelson I think his "intertwingled" utopia is a solution for a problem that only he has, mixed with unworkable ideas for both hyperlinked media and for micropayments and copyright that I think even the RIAA would find laughably unenforceable. And, like many utopian ideals, the first step is to become ubiquitous. HTTP and HTML are the Whoopee Cushion and Joy Buzzer of Internet protocols, only comprehensible as elaborate practical jokes. For anyone who has tried to accomplish anything serious on the Web, it's pretty obvious that of the various implementations of a worldwide hypertext protocol, we have the worst one possible. He could easily have had it in mind. The entire premise of Xanadu revolved around solving an intricate thicket of problems, ahead of time, and in concert with each other. Given that none of those problems have really been resolved individually in the ensuing 50 years gives some idea of the scope of this. While computers are good at many things, fixing problems that are social or personal are not among them, and I think that ultimately Xanadu serves as a reminder of that limit. Douglas R. Dechow is a Writer, a Science Nerd, and a Librarian. Doug is currently working on his first novel, a cross-country spy thriller set during the Manhattan Project. Doug writes Lofty Ambitions blog with his wife, Anna Leahy. Together, Doug and Anna have previously published in the Smithsonian's Air & Space magazine, the BBC Online, Fifth Wednesday, and Chapman Magazine. He is the Digita Douglas R. Dechow is a Writer, a Science Nerd, and a Librarian. Doug is currently working on his first novel, a cross-country spy thriller set during the Manhattan Project. Doug writes Lofty Ambitions blog with his wife, Anna Leahy. Together, Doug and Anna have previously published in the Smithsonian's Air & Space magazine, the BBC Online, Fifth Wednesday, and Chapman Magazine. He is the Digital Humanities and Sciences Librarian at Chapman University in Orange, California. He is also the Curator of the Roger and Roberta Boisjoly Challenger Disaster Collection.